There is a huge story brewing in Toronto. Stories are breaking that the team has started to rebel against Blue Jays manager Cito Gaston. But there is also serious doubt as to where this story is coming from. First, as Richard Griffin of the Toronto Star points out, it is unusual that a team that has been lost by its manager does so while on its best streak of the season. They've won their last six games and nine of their last ten. Ken Rosenthal who blew this story up has been (to put it gently) annoying a lot of people with unsubstantiated rumors and exaggerations (exactly what he generally accuses all bloggers of doing) this season. Griffin points out that Rosenthal generally gets his stories (at least in Toronto) from the front office and not the players in the clubhouse. Thoughts are that J.P. Ricciardi (fired today) planted the story on his way out the door. Managers always seem to get either too much credit or none at all. 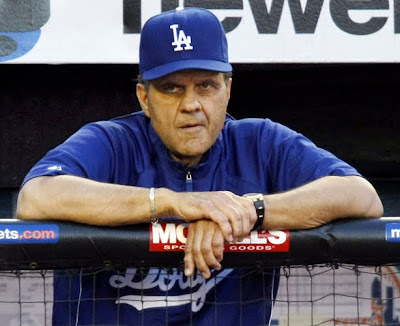 Many stat guys will tell you that a good major league manager has an impact on very few games. I haven't decided whether I believe that or not. I think a good manager might have a huge impact everyday that is simply not quantifiable. But just because we can't (or it is hard to) count it does not mean it doesn't exist. As fantasy owners we are a little more likely to see the things managers do that affect our games. We notice that Matt Kemp is batting seventh in the lineup despite being the best hitter on the team. We can read between the lines and realize that Cito Gaston has a problem with B.J. Ryan in Spring Training. We know that Dusty Baker will give his favorite veterans many opportunities but that rookies and younger players had better perform one way or another if they want to stay in the lineup. Fantasy owners can get a huge jump on their competition by getting to know managers and how they do things. This is not simply reading what they say to the press. Most of us know that we can't take their words for much. But if we listen to their words and watch what they do we can build a very good picture of what they really think. This is hugely important to owners that want to play Advanced Fantasy Baseball. Your player evaluations are not complete if you haven't taken the time to consider what the team's manager and front office personnel think about him. I have made this mistake at times this season. Drew Sutton and Kevin Frandsen might have better skills than the players in front of them but unless they win the approval of their respective managers they would be lucky to make their teams out of Spring Training. There have been various attempts by very smart people at Baseball Prospectus, Hardball Times and a few other sites to quantify a manager's impact on the game. But it's remains difficult to measure but there has been progress. Recently, Jeremy Greenhouse wrote an article for the Baseball Analysts that examines the impact managers have on major league bullpens. The results are very interesting. It includes some very good graphics that make the difference between some teams very clear. ...La Russa does a fantastic job of platooning. Both lefties he’s utilized out of the pen have had the benefit of facing a majority of same-handed batters. Trever Miller has put up great numbers this year, and La Russa would be well-served to use him as the southpaw in a righty-lefty combination with Kyle McClellan who has been holding his own as La Russa's go-to guy after Franklin. There is a dilemma in the case of Miller, who is truly exceptional against lefties to the tune of 37 strikeouts to six walks this year. So in a relatively close game, should La Russa bring him in once the starter is out and a lefty is up to ensure quality innings from Miller, or should La Russa at times wait and hope that Miller might have the chance to face a couple lefties in the 8th or 9th when the leverage is highest, but risk not pitching Miller at all? The Baseball Analysts is a great site that every fantasy owner interested in increasing their understanding of the game of baseball should be reading. They regularly evaluate pitchers and hitters in great detail, they study prospects and release lists that are very underrated by those that get intense about minor leaguers. If they do what they usually do you can expect very nice reports on the non-tenders, Rule V, and Arizona Fall League players.